“We have agreed on a new venue in Bulamu Gayaza. His earlier venue violated Electoral Commission campaign guidelines and he risked being disqualified ” said Frank Mwesigwa the Kampala Metropolitan Police Commander. 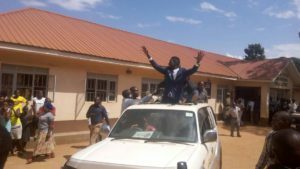 Bobi Wine waving to his supporters after he was released. 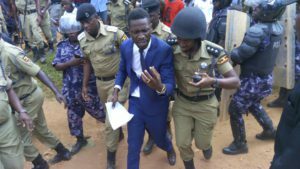 Bobi Wine refused to vacate the ground and a standoff ensued, leading Police to take the drastic action to arrest him. Museveni’s aides and SFC soldiers have since arrived at Wampewo where his rally is planned. Meanwhile, FDC candidate Apollo Kantiti is said to have abandoned plans for his rally alongside his supporters and headed for Kiira Road to demand for the release of Bobi Wine. Supporters of the popular singer, led by former presidential candidate Samuel Walter Lubega, are protesting the arrest that comes at the climax of the hotly contested by-election. It is not yet clear how the dramatic turn of events will impact on the outcome of the y-election, although many social media commentators have been quick to note that the arrest will only serve to raise Bobi Wine’s stature and guarantee him the sympathy vote given its timing. The arrest has been widely covered by the media, shadowing the President’s rally at Wampewo.